The editor of Upside Down World, Benjamin Dangl, recently suggested ways the U.S. could pull through its economic crisis by looking at certain social movements in South America. Comparing the Chicago factory occupation with Argentina worker coops, he pointed out other protests that led to significant change, and from which Americans might take inspiration. As the economic crisis in the US worsens, and the need to pressure the Obama administration looms, movements in the US could seek such commonality with movements in South America. 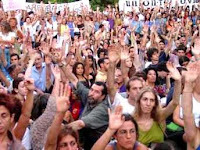 Of the countless examples of recent social movement victories in South America, here are a few that could suggest potential blueprints for social change in the US. Labels: activism, corporate issues, latin america, U.S.